Below are listed the most amazing natural and man made landmarks of California. Devils Postpile – a cliff of very well formed columnar basalt. This cliff resembles a heap of vertically placed piles. El Capitan – granite monolith with 900 m tall, vertical wall. One of the most challenging climbing routes in the world. 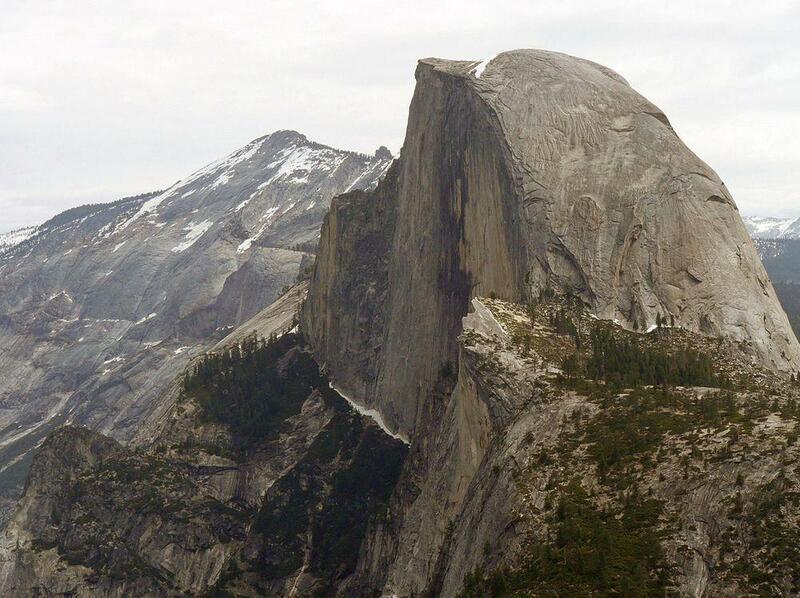 Half Dome – granite dome rising 1,444 m tall above the surroundings. Kings Canyon – up to 2,500 m deep canyon shaped by glaciers in granite bedrock. Here is located Kings Gate – granite peak with nearly vertical, 610 m tall wall. Tenaya Canyon – deep, dramatic-looking canyon. Approximately 16 km long. Trona Pinnacles – group of more than 500 tufa spires rising from the bed of dry Searles Lake. Spires are up to 43 m high. Yosemite Valley – up to 914 m deep, glacier carved cleft in granite rocks. Impressive landscape. Bigfoot Cave – enormous cave, 20 km long and up to 367 m deep. This cave is very challenging to its explorers. Black Chasm Cave – this cave has unusual formations of helictites – horizontally growing speleothems. Crystal Cave – this 4.7 km long cave is opened to tourists. Beautiful cave formations have been well preserved. Lilburn Cave – the longest known cave in California, 34.6 km long. Moaning Cavern – cave with vertical entrance shaft. Here have fallen and died prehistoric people and extinct animals. Water drops create a moaning sound which is heard outside the cave. Ursa Minor – recently discovered, beautiful cave. The ceiling of the cave is sparkling due to millions of small crystals. Cave is rich with rare speleothems – several meters long soda straws, cave pearls and others. Bridalveil Falls – 188 m tall, nearly vertical waterfall. One of the most visited waterfalls in Yosemite National Park. Burney Falls – up to 40 m tall waterfall, created by powerful springs and emanating from cliff wall. Springs produce up to 4 m³ of water per second. 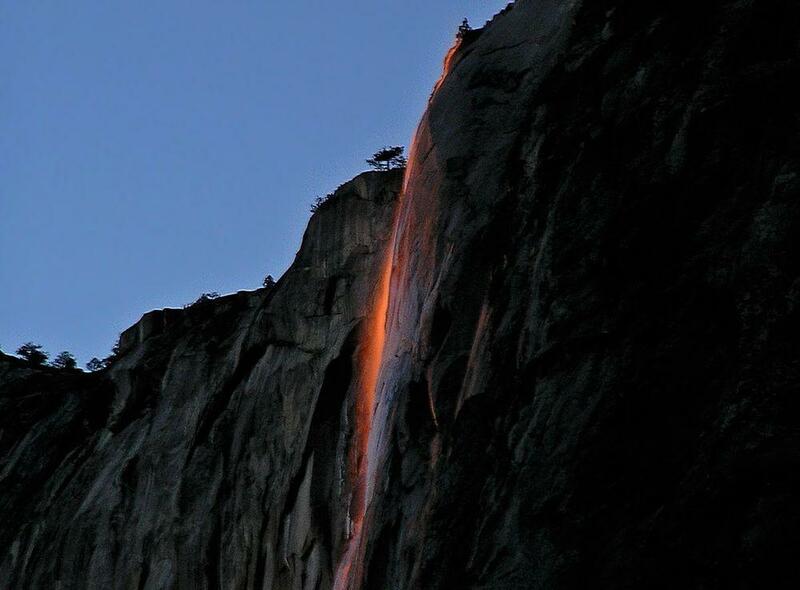 Horsetail Fall – very tall, seasonal waterfall, which in the late February may be illuminated by the sunset creating an illusion of falling fire. Waterfall is 650 m tall, tallest cascade – 480 m tall. Nevada Fall – mighty, 181 m tall waterfall on Merced River. Ribbon Fall – tallest single-drop waterfall in North America, 491 m tall. Tueeulala Falls – 270 m tall waterfall, tallest of the two drops is 180 m tall. Vernal Fall – 97 m tall, free falling waterfall on Merced River. Waterwheel Falls – largest waterfall on Tuolumne Rover. This waterfall has a "waterwheel" effect where the water hits the rock and is thrown up backwards. Some 110 m tall. 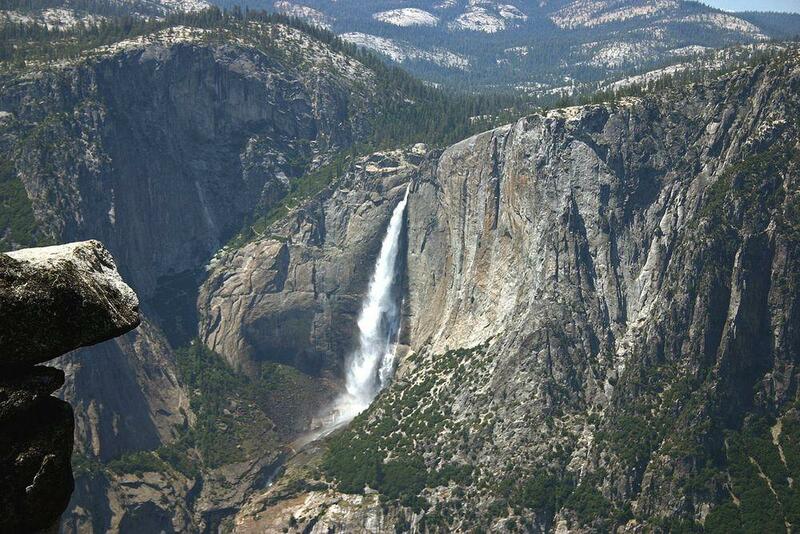 Yosemite Falls – these falls are 739 meters high, have 7 drops and are 28 meters wide. One of the most visited waterfalls in world. Tallest plunge is 436 m tall. 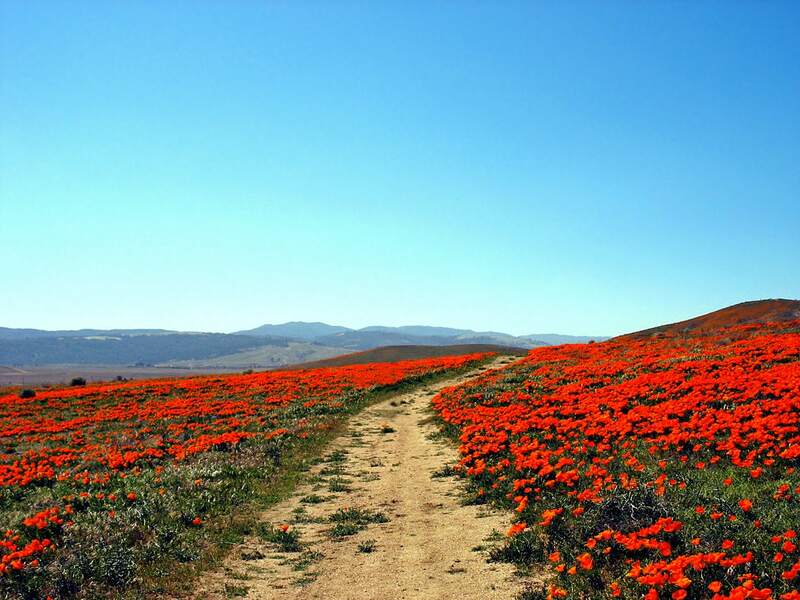 Antelope Valley California Poppy Reserve – high desert environment, area of the richest and most consistent flowering of California poppy (Eschscholzia californica Cham.). Ancient Bristlecone Pine Forest – grove of Great Basin Bristlecone Pine (Pinus longaeva D.K.Bailey), contains oldest known individual trees in the world, more than 4,750 years old. Bear Valley wildflower meadows – one of the most impressive spring wildflower displays in Northern California, covered with millions of California poppies and other flowers. Area – more than 6,000 ha. 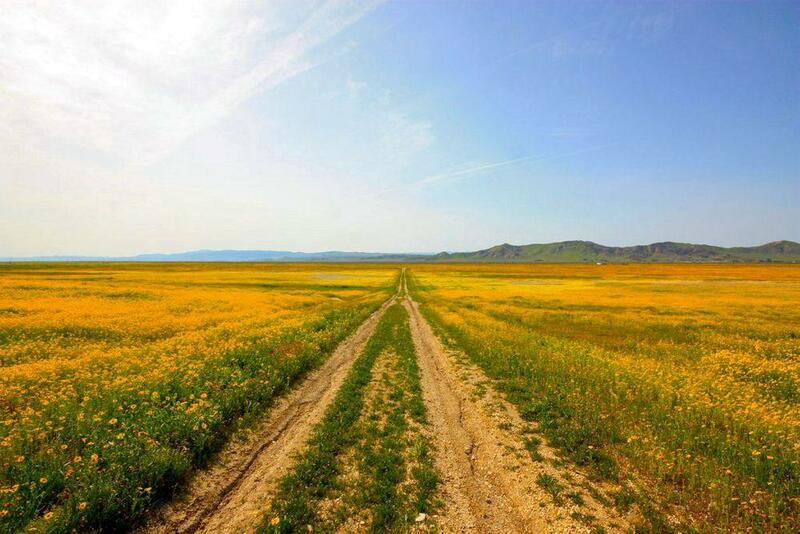 Carrizo Plain wildflower meadows – some of the largest and most impressive spring wildflower fields in California, more than 1,000 km² large. Diverse types of meadows, rare and endemic species of plants. Giant Forest – unique forest with stands of giant sequoia trees (Sequoiadendron giganteum (Lindl.) J.Buchh.) – the largest trees in world. This is the easiest to access sequoia grove but also contains the largest trees – five of the ten largest trees on Earth are located in this grove. Area – 7.6 km2. In California are located several more notable groves of these giant trees. Lost Horse Valley – Joshua Tree National Park. Best grove of Joshua Tree (Yucca brevifolia Engelm.) – visually impressive plant. Mono Lake – lake with alkaline water and characteristic, eerie tufa towers. Lake has unusual, very productive ecosystem, which includes also the unique bacteria GFAJ-1, which uses arsenic in its cellular structure. Here live also other endemic species, e.g. Mono Lake brine shrimp (Artemia monica). Paoha island in the lake contains many hot springs and fumaroles. Redwood Mountain Grove – the largest grove (1300 ha) of giant sequoia on Earth. 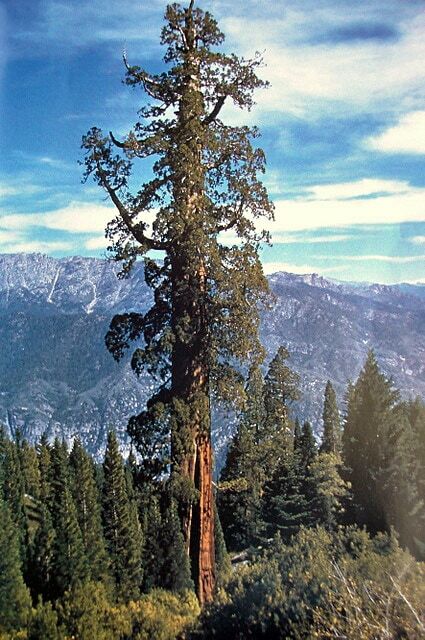 Here grows also the tallest publicly announced giant sequoia in the world – Hyperion. Boole Tree – giant sequoia (Sequoiadendron giganteum (Lindl. )), the largest tree in Converse Basin grove. Height 81.9 m, girth at breast height is 24.3 m, volume 1,203 m³. Devil’s Canyon Colossus – largest incense-cedar (Calocedrus decurrens ((Torrey) Florin), volume 223 m3. 50.3 m high, diameter 3.78 m.
Dorrington sugar pine – largest sugar pine (Pinus lambertiana Douglas). Volume 255 m3, diameter 3.53 m, height 66.1 m.
General Grant Tree – giant sequoia (Sequoiadendron giganteum (Lindl. )), second largest tree in the world. Height 81.5 m, girth at breast height 27.8 m, volume 1,320 m3. This beautiful tree is declared as a National Shrine, memorial to those who died in war. General Sherman – giant sequoia (Sequoiadendron giganteum (Lindl.) J.Buchh. ), the largest tree of the world by volume. Volume 1,487 m3. Height 83.8 m, girth at breast height 25.9 m. Believed to be 2,300 – 2,700 years old. Hyperion – tallest announced tree in the world (there are taller ones), coast redwood (Sequoia sempervirens (D. Don) Endl.). 115.66 m tall, diameter 4.63 m. Contains 502 m3 of wood. In total more than 500 coast redwoods exceed height of 103 m.
Lost Monarch – largest redwood (Sequoia sempervirens (D. Don) Endl.) in the world. Circumference 24.13 m (includes multiple trunks). Volume 1,206 m3, Height 97.84 m.
Methuselah – Great Basin bristlecone pine (Pinus longaeva D.K.Bailey). Oldest known individual tree in world, 4,844 years old. Raven’s Tower – reportedly tallest Sitka spruce (Picea sitchensis (Bong) Carr. ), 96.7 m high. Tallest Giant Sequoia in Converse Basin – Converse Basin. Tallest giant sequoia (Sequoiadendron giganteum (Lindl. )), 95.8 m high. The Chandelier Tree – enormous coast redwood (Sequoia sempervirens (D. Don) Endl.) with large 1.83 x 2.64 m hole carved in the 1930s – car can drive through it. Height of the tree – 96 m.
Bumpass Hell – geothermal field with hot springs, fumaroles, mud pots. Visually the most impressive geothermal area near Lassen volcano. La Brea tar pits – site where in the tar have been preserved numerous extinct animals such as two species of mammoth, sabre-toothed cats, American lions and many other. Racetrack Playa – dry lake in Death Valley, where the "sailing stones" have left traces in the mud. Stones are moved by wind in wet mud together with thin ice sheets at the moment when ice sheets are melting. Blythe Intaglios – large geoglyphs (gigantic figures on flat surface). The largest geoglyph is 52 m long depiction of a human. In this area are located several dozen such figures and also a labyrinth – Topock Maze. Age is unknown. 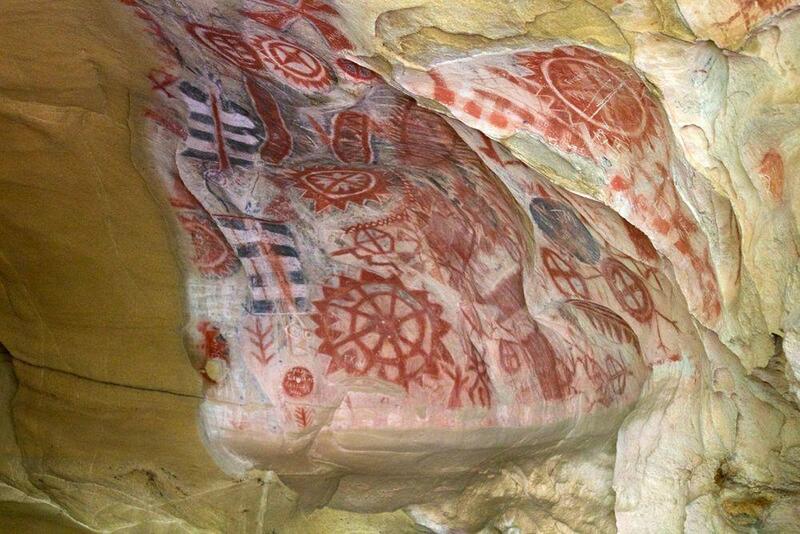 Chumash Painted Cave – small sandstone cave with red, white and black painting, which depicts the cosmology of Chumash people. Age is unknown, between 200 and 1000 years. Little Petroglyph Canyon – canyon with more than 20,000 petroglyphs, created by Coso people. Petroglyph Point – large sandstone outcropping covered with one of the largest displays of native American art in North America, with more than 5,000 carvings. This site is sacred to local Modoc people. 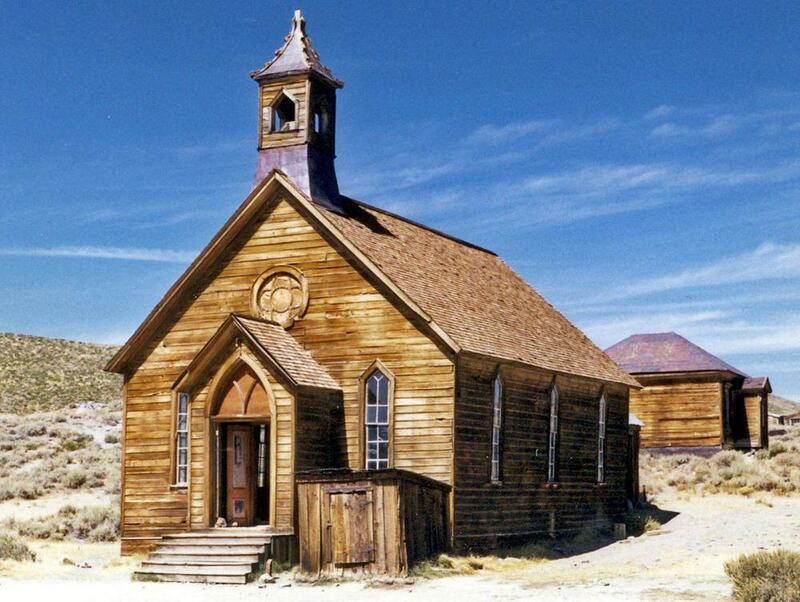 Bodie – remarkably well preserved ghost town, developed during the Californian gold rush in 1876. Cathedral of San Carlos Borromeo – the oldest stone building in California. This church was constructed in 1794 and is the second oldest operating cathedral in United States. Fort Ross – former Russian fortress and village, established 1812. It was the southernmost Russian settlement in Americas, here has been reconstructed a complex of traditional Russian wooden buildings. Hotel del Coronado – giant wooden building – luxury beachfront hotel. Constructed in 1888, when it was the largest resort hotel in the world. La Purissima – the best preserved Spanish mission in California, with nine buildings. Established in 1787, after an earthquake rebuilt in its current site in 1812. Mission San Diego de Alcalá – first Franciscan mission in California, founded in 1769. Established by Spaniards and long inhabited by Kumeyaay Indians. Presidio of Santa Barbara – this historical fortress includes El Cuartel – one of the oldest buildings in California, constructed by Spanish in 1782. Eames House – early example of modern architecture. This private house was constructed in 1949, designed by its owners Charles and Ray Eames. 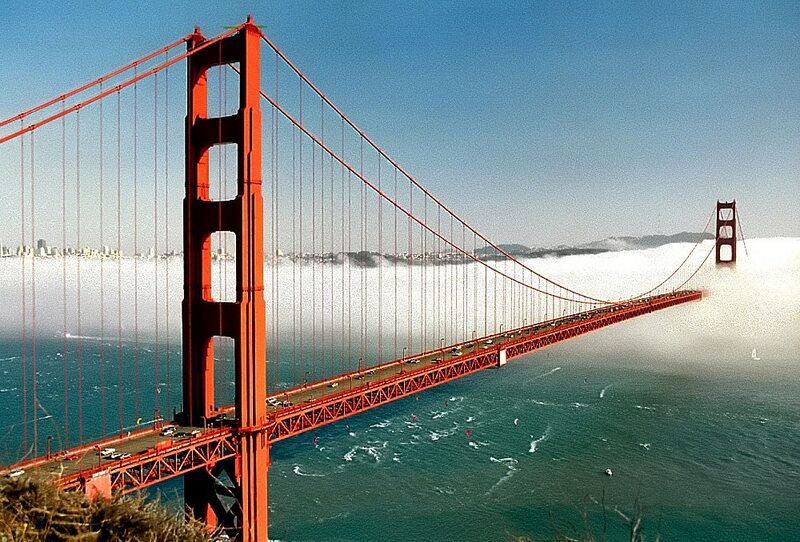 Golden Gate Bridge – iconic bridge, one of the most popular bridges in the world. This 2,737 m long suspension bridge was constructed in 1933 – 1937. Pylons are 227 m high, the span under the bridge is 67 m.
Hearst Castle – one of most luxurious buildings in United States, constructed for the newspaper magnate William Randolph Hearst in 1919 – 1947. Contains huge collection of art and antiques. Among the many impressive parts of this complex well known is Neptune Pool with Roman temple, brought from Europe. Hollyhock House (Aline Barnsdall Complex) – private villa in Art Deco (Mayan Revival) style, designed by Frank Lloyd Wright and built in 1919 – 1921. Also the furniture is designed by Wright. Hollywood Sign – one of American cultural icons, 14 m tall letters "HOLLYWOOD". erected in 1923. Mission Inn – enormous hotel in Mission Revival Style, gradually extended in 1902 – 1935. The architecture of this complex is diverse, eclectic – and very lively and impressive. Paramount Theatre – large movie theater, built in Art Deco style in 1931. San Francisco cable cars – the last manually operated system of cable cars in the world. Development started in 1873. Stahl House No 22. – masterpiece of minimalist design for private houses. Constructed in 1959, with its architecture well ahead of the time. Walt Disney Concert Hall – concert hall with amazing architecture, built in 2003, designed by Frank Gehry. Although California is one of states in the United States of America, Americans often compare it to a separate country, e.g. "if California would be a country, it would have the eighth largest economy in the world". We can go on with this comparison – California has more landmarks and attractions than many large countries of the world. Cliff formations and waterfalls – in Yosemite National Park are located some of the most impressive cliff walls and waterfalls in the world, such as the 1,444 m tall Half Dome or the 739 m tall Yosemite Falls. Unique ecosystems and giant trees – California has the oldest, tallest and largest trees in the world – on in some places these trees form unique forests. California has also some of the most spectacular desert ecosystems. Modern architecture – California has been one of the most affluent places in Earth for many decades – and thanks to the ambitions of Californians here have been created many spectacular and unusual structures. One of the tallest waterfalls in North America is Yosemite Falls. Total height of this waterfall is 739 m, but especially impressive is the tallest cascade if this waterfall – the whooping 436 m! Moon California Hiking shows hikers the best way to experience all California has to offer-from breathtaking coastal walks north of Los Angeles to challenging backcountry treks in the Sierra Nevadas. Stienstra and Brown include unique trip ideas, including Best Desert Hikes, and Best Hikes for Redwoods. Complete with detailed regional maps, hiking tips, difficulty and quality ratings for each hike, Moon California Hiking provides hikers with all the necessary tools to head outdoors. A fun, fresh tribute to the Golden State, illustrated with gorgeous color photography, fascinating historical images, and cool memorabilia. Learn anew the legends, landmarks, and lore of historic sites, such as Bodie, Point Reyes, the Knights Ferry Bridge, Mission Santa Barbara, Carson Mansion in Old Town Eureka, Death Valley, Glacier Point, and Alcatraz.